Web push notifications are still a relatively new concept for people, and because of that a really common question we get here at Aimtell is asking about the difference between web push notifications and email. We get it. Email is an established platform that everyone has experience using. If there are no real differences between web push and email, why take the time to learn a new system? Here’s the thing- there are plenty of differences between email and web push notifications. And as you’ll see, the differences are what make web push so great. 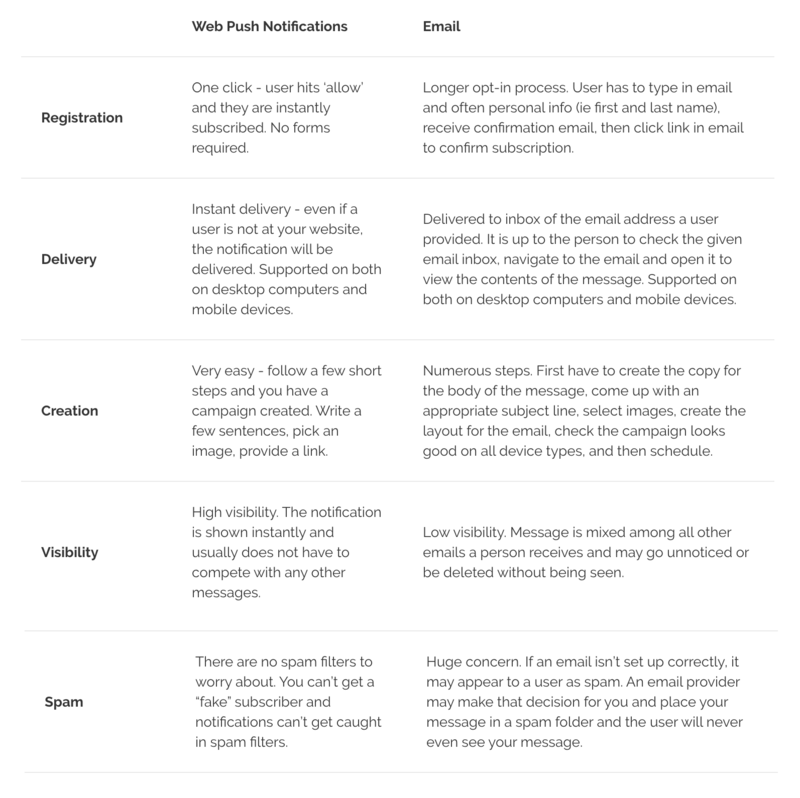 To best explain things, we decided to created this chart to highlight the main differences between email and web push notifications. Hopefully this chart helps to clarify any confusion you might have between the two tools. From a user first opting in, to creation, delivery, reception, and more, web push notifications and email differ in just about every regard. Email marketing has been around for a long time, and at one point it was an incredibly effective tool. While it is by no means obsolete, it has lost a lot of its initial effectiveness, and is only continuing to do so. Web push notifications offer brands a new way of interacting and communicating with their subscribers. For a more detailed look at web push, check out our Beginner’s Guide. If you wish to get started using Aimtell, click here.